Like our free content? Then you'll love our exclusive Club! 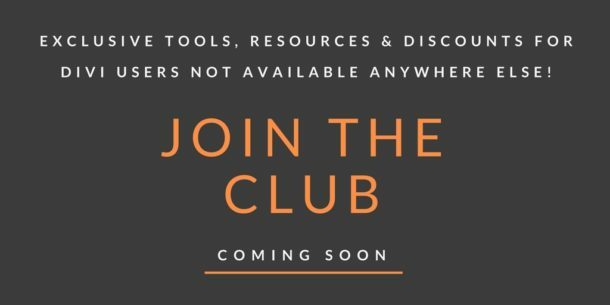 Divi Academy Membership gives you exclusive access to over 110 resources, including child themes, layouts, cheatsheets, tutorials, live training and member perks. And new content is added EVERY Monday! 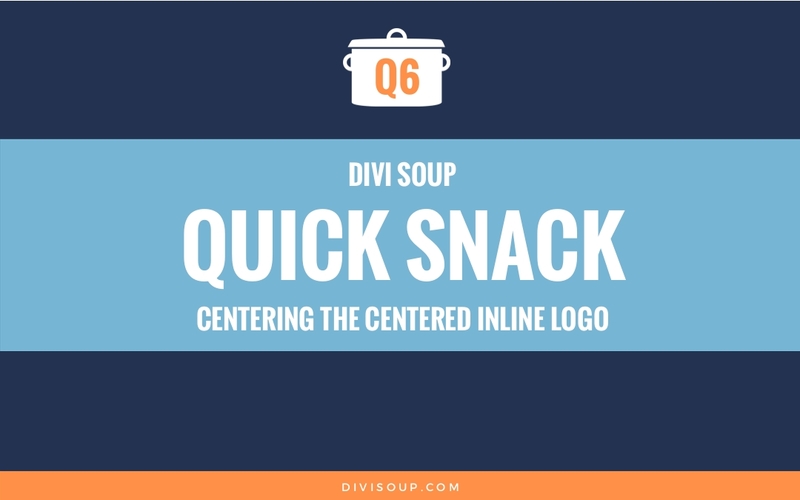 One major issue I have with Divi is the fact that if you are using the centered inline logo option, and you do not have an even number of menu items with a roughly even number of characters, then it always pushes to logo slightly to the right. I can get a little obsessive about alignment and spacing so for me, the logo should always sit directly in the center and the menu items should fit around it. Imagine you are lying on an inflatable lilo in a swimming pool, you can paddle over and ‘float: left;’ by holding onto the left side of the pool, and then you can paddle over and ‘float: right;’ by holding onto the right side of the pool. Make sense? Good. So now you want to ‘float: center;’, so you paddle to the middle of the pool and sit for a minute, but guess what? Yep, you got it: nothing to hold onto. So what happens? you just drift about aimlessly pushed left and right by whatever is happening at either side of you. The same principles apply when you try to centrally float an element with CSS. All is not lost though, at least not with the Divi centered inline logo option! The way we are going to fix this is by using our old friend, the ‘negative margin’. This should take you around 5 minutes max. Let’s make sure we have our logo set up correctly, so navigate to Divi > Theme Customiser > Header & Navigation > Header Format and select the Centered Inline Logo option from the drop down box. Don’t forget to Save & Publish. OK so now we have our menu set up, but this is how it looks, my menu items are not even so the logo is being pushed to the right. All we have to do to fix this is to add a negative margin to the navigation. So copy and paste this CSS snippet into your Child Theme Stylesheet or the Divi epanel custom CSS box and adjust the negative left margin pixel value until you get your logo central. -80px works for me but you will need to change this as it will depend on the size of your logo, the number of menu items and the amount of characters in those menu items. A quick way to check the logo is central is to view it on a page where you have two columns at the top. You can see from the image below my logo is now pretty central. If you found this helpful please leave a comment and subscribe to my newsletter for all my latest Divi related content. Michelle Nunan is a multi-award winning marketer & trainer and full time Divi educator as well as a mother of two beautiful girls and two cheeky Black Labradors called Harley & Chaz. Michelle has been building websites since the late nineties, back in the days of GeoCities and Napster, before the web was the wonderful place it is now. 25 awesome free Divi resources just for you! Subscribe to receive regular emails packed with tips, tricks, tutorials, freebies, product info and promotional offers, and get instant access to 25 completely free awesome Divi resources! We take your privacy seriously, and you can opt-out at any time. halo michelle, i am a newbie of divi. i have downloaded 25 awesome free civi resources. what are these ? lay out or plugin ? And how to use it? Awesome tutorial and thank you! Wondering, would this technique work to create something like the following? I’m attempting to create that Logo look but not sure if this here is my answer. Ty! Thank you! This worked beautifully on desktop, but alas – on mobile when you’re only dealing with a hamburger, you don’t need that shift. Any thoughts on how I can disable for mobile? I think that might put it back to center for me. Thanks Michelle. But darn – still not working. http://www.somethingsawry.com (ha – aptly named for my problem!) Looks fabulous on desktop – not on mobile though. Logo still off-center. Yay! That worked. Thanks SO much!! Does this fix the weird shifting of the logo on Safari? When you check my site on every browser it’s fine, but on Safari, after the first scroll, the logo shifts to cover the menu item to the right. Thanks for this snack, Michelle! Works fine. Do u know how this header works? h o b a n i.com/ ? All in the same block, logo and menus itens. I can´t reproduce in divi. Can u help me? Thank you Michelle! You’re the best! Thank you Michelle, it worked perfectly with an increased px! Happy days! One suggestion would be to use relative measurements so that the centering adjustment has the best chance of working across different displays. Using a fixed measurement like px might be problematic as the screen got smaller. Thank you so much, Michelle! I quit using the centered inline for that exact reason. You’re so awesome to share your hard-earned knowledge with us! Divi Soup is a tutorial website for enthusiasts of the Divi Theme by Elegant Themes. Founded by Michelle Nunan, a full time Divi educator and child theme developer, Divi Soup aims to bring useful tutorials, tips and tricks to both new and experienced Divi users. Michelle also runs Divi Academy where she teaches Divi related courses and hosts a membership site for Divi users. Come join the fun in the Divi Soupies Facebook Group. I am grateful to be of service and bring you content free of charge. In order to do this, when you click links on this site and purchase items, I may receive a referral commission, there is no additional charge to you. Your support in purchasing through these links enables me to keep most of the content on this site free. Thank you!